This companion exhibition to our historic trees show looks at how artists working today are still drawing inspiration from trees. 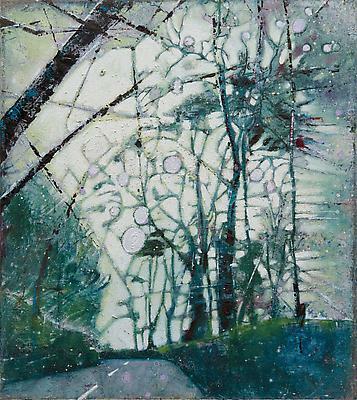 It examines contemporary artists’ approach to trees from the digital manipulations of Dan Hays, Christiane Baumgartner and Katsutoshi Yuasa to the plein air paintings of Kurt Jackson and Michelle Dovey. David Nash’s Ash Dome takes on new meaning in the light of the latest fungal threat to our native trees. George Shaw revisits the childhood mysteries of a patch of urban woodland. Ann Arnold, Graham Arnold and David Inshaw imbue the Wessex landscape with a sense of magic and wonder. Hannah Maybank, Mick Moon, Anthony Whishaw and Paul Winstanley explore the threshold where, as the light fades, familiarity and reassurance meet otherworldliness and doubt. We have invited thirty-three artists to contribute a work and explain what trees mean to them and how they figure in their art practice. Those contributing are: Jemma Appleby, Ann Arnold, Graham Arnold, Christiane Baumgartner, Jo Barry, Philippa Beale, John Blandy, Tim Craven, Michelle Dovey, Dan Hays, David Inshaw, Kurt Jackson, Abi Kremer, Ffiona Lewis, Fiona M. E. McIntyre, Elizabeth Magill, Hannah Maybank, Mick Moon, Paul Morrison, David Nash, Howard Phipps, Michael Porter, Lisa Ruyter, John Salt, Nick Schlee, Celia de Serra, George Shaw, Lesley Slight, Alice Stepanek and Steven Maslin, Anthony Whishaw, Paul Winstanley, Clare Woods and Katsutoshi Yuasa. Exhibition produced in partnership with Southampton City Art Gallery.